San Francisco Municipal Reports for the Fiscal Year 1891-92, Ending June 30, 1892. Published by order of the Board of Supervisers, San Francisco, W. H. Hinton & Co.Printers. 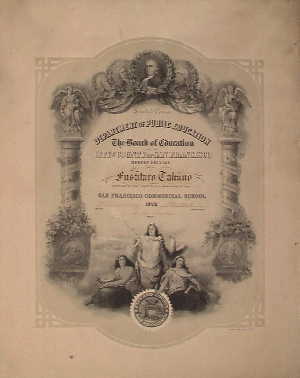 Course of Study of the Commercial High School, San Francisco, August, 1892, San Francisco Printing Company.